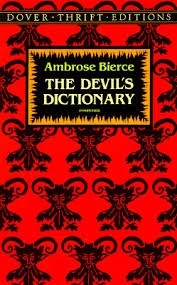 The Devil's Dictionary is an laugh-out-loud and extremely satiric "dictionary" where each word has its own biting definition, often accompanied by an amusing poem or verse. Read this with someone who has a good sense of humour by your side because it will drive you mad if you cannot read some of the funniest ones out loud. A very rewarding addition to your desk!